For his acclaimed writings and brave commitment to a free and democratic Russia, Khodorkovsky has received or has been nominated for numerous prizes. In December 2011, Khodorkovsky was among the top four finalists nominated for the Sakharov Prize for Journalism as an Act of Conscience, for his articles published in Novaya Gazeta. Since 2001, the prize has been awarded to journalists who defend the values of the eminent Soviet nuclear physicist, dissident and human rights activist Andrei Sakharov. Khodorkovsky’s mother, Marina, received an honorary certificate on her son’s behalf. In December 2010, Khodorkovsky was awarded the Dr Rainer Hildebrandt Medal, an international human rights award in recognition of extraordinary, non-violent commitment to human rights. Khodorkovsky won the award alongside his human rights lawyer, Yuri Schmidt, and Hungarian reformer Imre Pozsgay. The jury for the award includes, amongst others, Nobel Peace Prize Laureate Henry Kissinger, President of Germany Joachim Gauck and former German foreign minister Hans-Dietrich Genscher. In a laudatory speech, Markus Löning, the German government’s human rights commissioner, expressed his respect for Khodorkovsky for standing for a free Russia where human rights have meaning. In a letter to Khodorkovsky, Nobel Literature Prize Laureate Herta Müller underlined that he is imprisoned because “he called for democracy in Russia” and compared his commitment to a peaceful transition with that of Chinese Nobel Peace Prize Laureate Liu Xiaobo. In October 2010, Ekho Mosvky Radio announced the creation of a Newsmaker of the Year Award, giving the title to a different individual for the past twenty years. For 2003, the year of his arrest, the award was attributed to Khodorkovsky. Other recipients included the murdered journalist Anna Politkovskaya for 2006 and Russia’s market reform architect Yegor Gaidar for 1992. In May 2010, Khodorkovsky was named “European of the week” by Radio France International for his ongoing capacity to force the Kremlin to react, despite his imprisonment since 2003. The award came after the success of a hunger strike by Khodorkovsky, which drew then-President Medvedev’s attention to the disrespect of Russian officials and courts for recent legal reforms. RFI awarded Khodorkovsky this honour again in 2013, following his 50th birthday on June 26. In January 2010, Khodorkovsky received a literary prize for his correspondence with Russian Booker Prize recipient Lyudmila Ulitskaya. The annual prize, which has been awarded by Znamya magazine for more than 20 years, was received by Khodorkovsky’s daughter Anastasia at a ceremony in Moscow. The prize funds were donated to the Podmoskovny Lyceum in Koralovo. 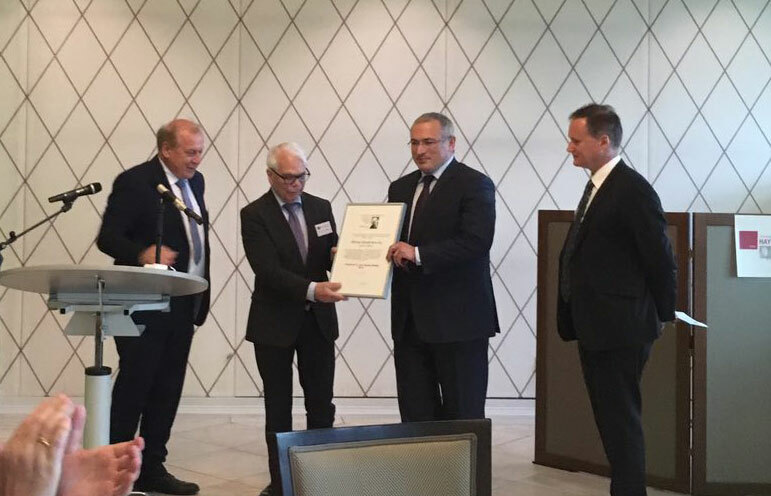 On the occasion of the 25th anniversary of the launch of the Polish newspaper Gazeta Wyborcza on May 9th 2014, Mikhail Khodorkovsky was presented with the ‘2014 Man of the Year‘ award by editor Adam Michnik. Michnik said Khodorkovsky became a symbol of truth about today’s Russia, symbol of weakness of Russian ruling elites and symbol of Russian pride and honour, courage and hope. On December 2016, Khodorkovsky was awarded the Knight of Freedom Award by the Casimir Pulanski Foundation. Named after the hero of the Polish insurrection of 1768 General Casimir Pulanski (1745-1779), the foundation gives out a yearly award to one outstanding individual who has promoted the values of freedom, justice and democracy. In the words of the head of the foundation Zbigniew Pisarski, Khodorkovsky was awarded ‘for his uncompromising efforts to build up the rule of law, civil society and promote European values in the Russian community.’ The European Academy of Diplomacy, the leading programme of the foundation, is the first non-governmental, non-profit diplomatic academy in Europe that aims to shape, sharpen and inspire a new generation of enlightened international leaders. On June 17 Mikhail Khodorkovsky became the recipient of the Hayek Award for Freedom. 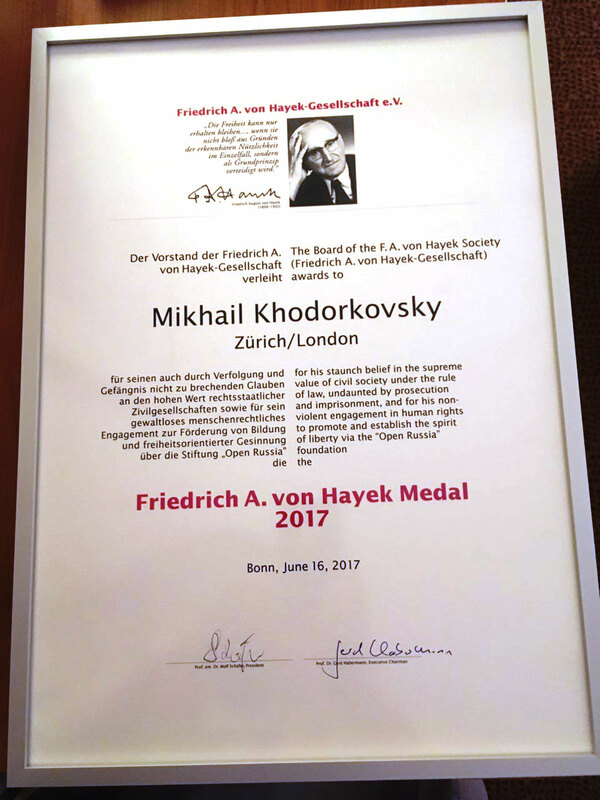 The award was set up by the Friedrich von Hayek Society which awards individuals for promoting the values of social and economic liberalism. Friedrich von Hayek was an Austrian economist and philosopher, as well as a representative of the new Austrian school of supporters of liberal economics and the free market. The award was presented by renowned German academic Wolf Schäfer, who commended Khodorkovsky for his entrepreneurial achievements and promotion of liberal ideas in the post-Soviet space, as well as helping to modernize and restructure the Russian economy. Schäfer also recognised Khodorkovsky’s contributions to social and educational projects through the Open Russia organisation. Open Russia, founded by Mikhail Khodorkovsky, had been promoting the values of pluralism and attempting to strengthen civil society. These endeavours eventually led to conflict with president Vladimir Putin in 2003, which saw the beginning of “the YUKOS affair” and Mikhail Khodorkovsky’s imprisonment. Amnesty International later recognised Khodorkovsky as a “political prisoner of conscience”.